The Hispanic Health Research Center (HHRC) was established at the Brownsville campus of the UTHealth School of Public Health in 2003 through funding from the National Center on Minority Health and Health Disparities at the National Institutes of Health. The HHRC is directed by Dr. Joseph McCormick. The primary objective of the Center is to identify the salient risk factors for obesity and diabetes and their complications in Americans of Mexican descent living in the Lower Rio Grande Valley. The HHRC was responsible for establishing the Cameron County Hispanic Cohort a Clinical Research Unit, on-site laboratory facilities to support epidemiological studies. The HHRC also engages extensively in community outreach to promote physical activity and healthful food choices in the Hispanic population. The Hispanic Health Research Center at the UTHealth School of Public Health in Brownsville is on one of the six campuses of UTHealth School of Public Health. The campus is located on its own site, adjacent to the UTRGV Brownsville Campus. The faculty has a wide range of expertise in epidemiology, disease control, behavioral health and outreach, data management and biostatistics and genetic epidemiology. They have extensive experience in research and teaching. Research is a major part of the expectations of all faculty as part of The University of Texas Health Science Center at Houston (UTHealth). All faculty are well-published with a range of research programs. Collaborative studies with established scientists at the Houston campus of the School of Public Health, the McGovern Medical School at UTHealth and The University of Texas MD Anderson Cancer Center also include collaborators from other institutions such as UTRGV, The University of Texas Health Science Center at San Antonio, University of California San Diego, Baylor College of Medicine, Vanderbilt University, the University of Washington, and many more. Further, research links with the medical community along the border include most of the clinics and hospitals in the area. The major research initiative of the HHRC is the Cameron County Hispanic Cohort (CCHC). This is a cohort of low-income Mexican Americans randomly recruited from households in Cameron, Hidalgo and Webb counties on the Mexican border. It now numbers more than 4,600 individuals followed up every five years. Data from the CCHC have been published widely and are being used to inform intervention and outreach programs. Sue Fisher-Hoch, MD oversees a NIH-supported Clinical Research Unit established in 2004.It is located in a suite of offices provided to us by the Valley Baptist Medical Center in Brownsville. It has a project manager, Rocio Uribe and project coordinator, Norma Perez-Olazaran several highly trained field workers. 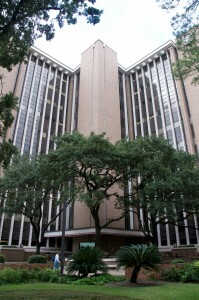 Since 2004, the Brownsville CRU has been an integral part of the UTHealth General Clinical Research Center in Houston. The CRU has recently been expanded to 3,423 square feet, with seven examination rooms, office space and a conference room equipped with video equipment for communicating with collaborators and telemedicine. A small laboratory area allows immediate processing and freezing of specimens. WiFi and 5 computers connected to the university network are also behind the firewall and provide video conferencing across the state. The Brownsville CRU is home of the Cameron County Hispanic Cohort uses a unique team approach tailored to the local community. CCHC investigators are Spanish-speaking, highly trained and experienced community health workers who conduct subject recruitment in local homes, processing and specimen collection. University vans are used for recruiting and transporting participants. The clinic is extensively equipped including several modalities for ultrasound, Dual-Energy X-ray Absorptiometry and dopper imaging. It also has a a three FibroScans incorporating Controlled Attenuation Parameter (CAP) which allows quantification of steatosis as well as measurement of liver stiffness indicating fibrosis using Vibration Controlled Transient Elastography technology (VCTE), two of which can be taken for home visits.The Brownsville CRU has two outposts, one in Laredo, Webb County, established in 2012, and the other a new center in Pharr, in Hidalgo county established in 2018. These sites provide a wider community sample. The Laredo CRU consists of 2,053 square feet which includes 4 exam rooms and a laboratory area. It is supported by a project manager and 3 recruiters. The Pharr clinic in Hidalgo county. Further research facilities are provided in the Doctor’s Hospital Renaissance in Edinburg, Hidalgo County, where we have dedicated research space within the new Transplant Unit. Here we conduct research with a second cohort consisting of hepatocellular carcinoma patients and their close relatives in collaboration with Drs. Almeda and Patil of DHR Laboratory. The University of Texas School of Public Health at Brownsville laboratory has a 6000 square foot wet-laboratory completed in 2008. The laboratory director. Marcela Morris, oversees laboratory technicians performing a wide range of studies on our CCHC specimens. The laboratory was designed to provide high technology and use of high throughput assays for screening large numbers of specimens from our field sites and clinics. The main laboratory space is divided into a BSL3 laboratory and a larger BSL2 laboratory with restricted access reserved for major equipment and for genetic and cell culture studies. A large open laboratory is available for general purposes. The laboratory possesses a Luminex 200X xMAP Technologies plate reader and 405 TS Magnetic Microplate Washer. It has the MicroLab Nimbus Elisa and the MicroLab Starlet Liquid Handling System from Hamilton. It has a Muse Cell Counter by EMD Millipore, and a QuantStudioDX Real Time PCR by Life Technologies. It has a SpectraMax MS Real Time Spectrophotometer by Molecuar Devices, a BD PACS CANTO 11 Flow Cytometer by BD Biosciences, and an Olympus IX51 fluorescent microscope and a CX31 Microscope. It has a NanoSprint nCounter, a BACTEC MGIT 960, 1575 Immunowash plate washer, PTC 200 Peltier Thermocycler, and a 2100 Agilent Bioanalyzer. Centrifuges includes a Cytospin 4 cell preparation centrifuge, one ultra-speed and 3 microcentrifuges. A specimen archive is also managed by the laboratory. Blanca Ortiz Community Outreach Annex is located at the University of Texas School of Public Health (UTSPH) Brownsville campus and houses many exciting activities. This annex provides vital work and meeting space dedicated to community outreach to improve public health through research and community projects at UTSPH Brownsville.One part of the annex houses promotoras or lay health workers who are professionals from the community who have been specifically chosen because of their talents in educating, motivating and teaching skills to community members for improving their health. They have been trained in topics such as physical activity, healthful food choices, diabetes and cancer prevention and control through the Tu Salud Si Cuenta! (Your Health Matters!) community wide campaign. The annex also provides a conference room for community meetings, a clinic space used by the Clinical Research Unit for clinical research activities including participant enrollment in the Cameron County Hispanic Cohort. Finally the annex provides an office for local health oriented non-profit organizations including Healthy Communities of Brownsville and The Brownsville Farmers’ Market. These organizations are working to improve the health of the community through environmental change efforts including recycling initiatives and access to locally grown fruits and vegetables. The entire annex is dedicated to community activities and as such is a warm place enriched by the volunteers and staff who work to provide healthy resources for the local community. The majority of the cohort has been recruited in Brownsville which has a large population of Mexican Americans resident for several generations. It is an American city with a strong Mexican flavor and culture with strong family and community ties. Laredo has a similar population and is the oldest city on the south Texas border (established 1755, population 236,091, 95.6% Hispanic) also with a large long-time resident Mexican American population. Most of the Hispanics along the border are Mexican Americans, particularly in the poorer communities and many have relatives in large cities across Texas and the United States (U.S.), Hispanics are the most rapidly growing minority in the U.S. now accounting for ~58 million, and constituting 37.6% of the population of Texas most of whom (31.6%) are Mexican American. This ethnic group generally represents a difficult-to-reach, low-income population with high health risk which is mostly missing from large national cohorts. The Hispanic Health Research Center of UTSPH-B has an interest in sharing specimens and data with other interested and qualified research groups of individual researchers who may wish to contribute analyses for the benefit of the scientific and health care communities. We encourage and solicit manuscript proposals and ancillary studies. The manuscripts is to be completed making use of the Cohort/Core data resources and submitting to the Cohort/Core Publications committee PRIOR to obtaining data and writing the manuscript. The ancillary studies is to be completed making use of the Cohort/Core data resources and specimen collections. PRIOR to obtaining data or specimens, please submit to the Ancillary Studies Committee.